Passion for Music, Improvisation & Healing Community? 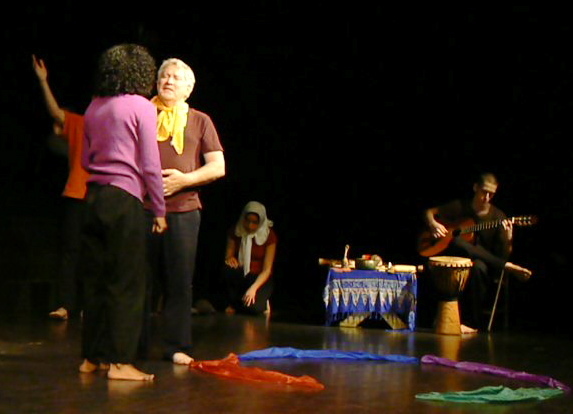 Jeremy Kiskaddin as the musician in the Healing York performance series (2008). River Crossing Playback Theatre in Columbia, PA is seeking a playful multi-instrumental musician to join our community theatre ensemble. In Playback theatre performances, audience members share thoughts, feelings, memories and autobiographical accounts, then watch as a team of actors and musicians transform these experiences into improvised theatre pieces. Musician candidates must be skilled in improvisation, sensitive to tone and story, and should have a passion for community healing through performing arts. You can work with a different primary instruments (generally acoustic) but percussion experience and proficiency in a variety of instruments is particularly helpful. Being able to step into small acting roles a plus! Contact shelly@rivercrossingplayback.org or 717-382-8292 to schedule an informal audition and orientation on an upcoming Wednesday evening rehearsal in Columbia, PA. This entry was posted in Muse and News on October 11, 2014 by chris.